1. What were your school colors? Blue and Gold. And by saying that my mind immediately starts singing my high school alma matter, and I kind of throw up a little in my mouth. Don't get me wrong, I loved my high school, but the fact that 10 years later I can sing the alma matter is kind of sickening I think. Or perhaps that's normal? Not really sure. 2. What's the best compliment you ever received? This is a hard one because I tend to not really notice compliments that much. I kind of tend to make an opinion of myself based on my own perspective, not someone else's. That being said, I LOVE LOVE LOVE when people tell me that my husband and I make beautiful babies. I know I am biased and all, but I have to agree. B-man is pretty darn cute (and side note: I have had 3 people in the last week tell me that my son is BEAUTIFUL. I know people are well intentioned, but I would much prefer if they just said handsome). 3. Do you buy cheap or expensive toilet paper? Neither? I don't really like the super cheap stuff, as it, ahem, chaps my hide :) But because a certain someone in our house likes to wipe until they shine, we can't use the expensive stuff either or our toilets clog. So we've compromised and purchase the Members Mark brand toilet paper. At $15 for 72 rolls (and yes, our family of 3, with only two who are potty trained) use 72 rolls every other month. Just for the record, I am a 4 ply girl, so you can do the math and know that it's not me who's rolling out the toilet paper dough. 4. Have you ever had a surprise party thrown for you? Or have you had one for someone else? Yes. I was 8 (or 9, can't remember). I was playing the Sega Genesis at my Great Aunt's house, when my mom came to get me and brought me in the kitchen. All of our family was there, and they all yelled surprise. I am pretty sure I ran back into the living room to sulk. I HATE surprises. HATE them. That was the first, and most probably, last surprise party ever thrown for me. 5. 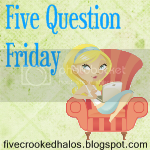 What is one material possession that you "can't live without"? If this question is hard to answer does that mean I am materialistic? EEEK. My first reaction answer is my computer. But then I think of my mattress, and how I love to sleep. So I'd have to say it's a tie between my mattress and my computer. Those were some fun questions thins week! Thanks Mama M.! If you're new to my blog, you might want to check out the awesome giveaway I've got going on right now... and I've got more in the works that you'll not want to miss out on, so stay tuned! Hope everyone has a GREAT weekend! It's Fun to Play with Daddy! Baby Wipes... It's What's for Dinner! Sick and Pregnancy Don't Mix.